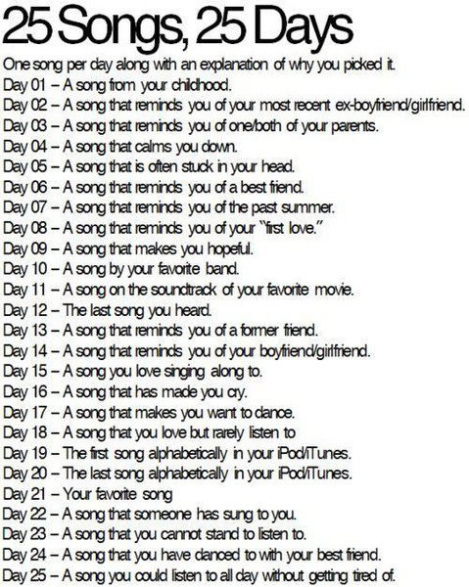 Day 20 – The last song alphabetically in my library. The last song in my library is called “…” How creative. It’s by a self-produced Swedish post-rock band called pg.lost (lower case with a dot in the middle–kids these days). If you’re not familiar with the genre, post-rock doesn’t contain traditional “rock” at all really; it’s called post-rock because it’s made with instruments typically associated with rock and roll, like electric guitars and drum kits, though not exclusively. I like to think of it as the new classical. While the arrangements aren’t orchestral, the sound is almost as big and full, and they often use orchestral instruments like strings and brass. Probably the most well-known post-rock band, and one of my favorites, is the Icelandic outfit, Sigur Rós. Ever heard of them? No? You’re totally missing out. All of their songs are gorgeous. They give me goosebumps. Post-rock is sometimes instrumental soundscapes that grow and shift and build as the songs move along. Most PR songs don’t even begin to kick in until 3-5 minutes. It’s excellent background music and I generally listen to post-rock in the morning until my brain is thoroughly infused with caffeine. I can’t find a video for “…” because try searching for “…” on the internet and see what happens, so here’s another song of theirs from the same album. The title track from Yes I Am is my favorite anyway. It really kills after the 3:30 mark. It’s absolutely beautiful. You can listen to “…” here and even download the whole album for $5 to help an independent band. Posted in 25 songs and tagged music, post-rock. Bookmark the permalink. Any chance you could upload an iPod playlist? I listen to piles of stuff in genres people know nothing about, so I’d probably be interested to learn of some different bands. Nice. I love musicians that evolve over time. Post-rock, huh? I used to be a big fan of what was referred to as “new age” music, a fusion of jazz, rock, and classical. Post-rock sort of reminds me a little bit of new age, only more “evolved.” Thanks for this. I listened to the two tracks from Pg.Lost as well as a few from Sigur Rós. Nice. By the way, the last track in my iTunes library is “1963” by New Order. I like the concept of a “more evolved” new age. The genre produces some absolutely beautiful music. Everyone should own all of Sigur Ros’ albums now. I could go on forever. I’ll stop now.